Runescape has been a leading MMORPG for over ten years with millions of subscribing players and billions of hours logged online chopping trees, crafting items and taking each other down in a rather unique PVP system. The game has a thriving economy which has survived several major overhauls throughout its inception, coming through each update as a whole new beast for opportunity and gameplay mechanics. Any player, especially a “veteran” would look upon the diverse economic and functional systems in Runescape and see them as timeless or even “too big to fail.” Is this really the case though? Is the game as flawless as most see it to be? Few know the truth as to why Partyhats in Runescape are priced as they are; why is blue really worth so much more than Purple? A story has been imprinted into Runescape’s economy and you can still feel the shockwaves in today’s prices for certain items, especially the coveted rares, such as Partyhats. Over a decade ago, back in Runescape classic, one player by the name of Sixfeetunder was experimenting with a way to trade the untradeable Scythe between him and his friends. Using a 3rd party program called Autorune, he attempted to transfer the untradeable item within a trade screen. What happened next would change Runescape history forever. By chance, Sixfeetunder accidentally entered the “ID number” for a random, non-stackable item in the game’s inventory, resulting in that item appearing in the other player’s trade window. While Sixfeetunder saw an item with zero numerical value, the trade recipient saw an item value of one, hastily accepting and receiving the “spawned” item. Runescape’s first dupe had been stumbled upon. In the next few days, with the help of ecstatic bragging by Sixfeetunder, dozens of players learned of this exploit and quickly began spawning the most valuable items in the game, items that were “discontinued,” retaining a high value due to their rarity. 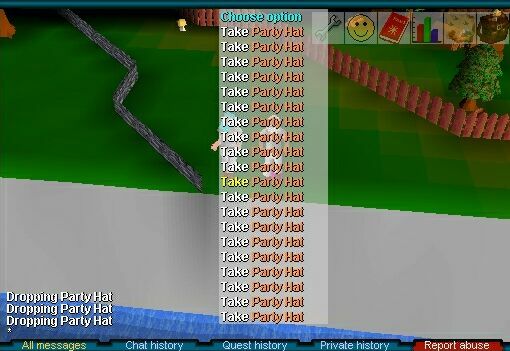 Interesting Fact: The Purple Partyhat, which at the time was the rarest and most valuable item was quickly flooded into the market, thousands being spawned and sold to unwitting players, eager to grab the game’s rarest items on the cheap, without realizing they were buying into a collapsing market. Very few people understood what was happening as rare items began flooding the market, dropping in price rapidly to the point where the items were worth less than ten percent of their original value. At this point, people started noticing something was wrong and the ensuing panic selling resulted in a price crash within a matter of hours. Smart dupers hopped off the rare bandwagon and decided to start duping trade items such as ores, hoping to cash out before the entire market ground to a halt, which it inevitably did. As true as a game- breaking exploit could ever be, Jagex, the company that created and runs Runescape quickly took notice. However, despite their most valiant efforts, Jagex simply couldn’t pinpoint the origin of the dupe and more than 24 hours passed without the exploit being patched, resulting in an act of desperation from the company watching their game collapse around them. Offering a lifetime membership to whoever came forward to explain the technicalities of the dupe, they began working on a fix within a matter of minutes as the first of hundreds of players came forward, eager to receive free membership. Unfortunately for all the potential do-gooders, only the very first person who revealed the dupe’s details to Jagex was awarded with the lifetime membership, scorning hundreds of players who were late to confess. For almost ten years, the land of Runescape grew, developing and flourishing in relative technical stability, avoiding any major bugs similar to the one which still had a lasting effect on the prices of certain items. A skill that had been in the game since 2006 - Construction, would be the catalyst for a duplication glitch to rival the scope and severity of the infamous Classic dupe. Unlike the discovery by Sixfeetunder, this dupe involved experience points rather than items, though you could argue experience in an expensive skill such as Construction costs a mountain of gold to gain, meaning any way to get extra XP is essentially saving you a bucket of cash. Gaining the maximum level of 99 could cost you tens or even hundreds of millions of gold to achieve, so the dupe discovered en-masse with the implementation of the God Statues must have seemed like a real-life miracle to cash-strapped players, providing a free method of getting from 1-99 in under 5 minutes. The God Statues offered an experience reward that equals a small percentage of your current XP in Construction after completing a relatively simple puzzle. Designed as a small and free boost to your next level, this puzzle inadvertently offered the keys to the top of the high scores as poor coding allowed you to use the “join a friend” option to teleport while in the puzzle interface, bugging it. Once bugged, you could repeatedly click on the completion portrait to claim your reward over and over again, as fast as you could click. This resulted in numerous comical videos showcasing players levelling different alternate accounts from level 1 to 99 in under 5 minutes at absolutely no cost, negating all of the investment that’s required to achieve the highest construction levels. Unlike the Classic dupe, Jagex quickly identified the problem and set upon patching it, which took a few short hours. In this time, thousands of players had illegitimately gained max level on not only their account, but other alternate accounts, one player even boosting 25 accounts to 99 construction on the same day. This resulted in the heavy fall of the ban hammer, wiping out thousands of bug-abusing accounts and thousands more alternate accounts. While the dupe was widespread, there was little effect on the economy due to the speed at which it was patched, resulting in minimal illegitimate gains effecting the market. For this reason, there was no rollback as the echo of the ban hammer had already contained the situation. Many 2000+ levelled accounts had been banned that day, taking with them billions of gold and items from the economy forever. So far we’ve had an item dupe and an XP dupe, but why should you care – how have they affected you in game? Most likely, these dupes haven’t directly affected your bank or your levelling, unless you happen to be a long-time player who was around in the early stages of Runescape classic and managed to snag yourself a Partyhat. The XP dupe didn’t really affect you unless you were directly banned for abusing it, in which case, you probably aren’t wondering how the dupe has affected you since you no longer have that account. Both of these dupes had immense but acute direct effects while having mild economic aftershocks which have definitely affected everything you’ve done in the game. Most easy to understand is the XP dupe, or more so, the banning of thousands of players. By removing these players from the game, you are directly taking out their combined wealth and items. Some may have had Partyhats, or some may have had stacks of gold waiting to be spent on trade items. 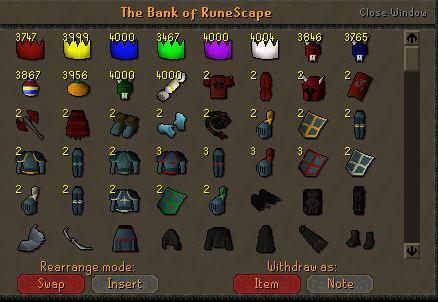 These items and gold stacks were removed, reducing the number of items in the game and reducing possible investment into the economy. Combined, this would’ve have a mild, but noticeable effect on the prices and supply of items. Slightly harder to pinpoint is the effect of the Item Duplication glitch, as its most obvious effects, the destruction of the economy, were removed after the rollback took place. The long term balance in the price of Partyhats being the main result, a more subtle effect on the Runescape economy was covertly imprinted even after a rollback. For the next 5 years, the prices of Partyhats remained relatively stable, hovering around the 20 million mark. People simply didn’t fully trust or understand the real rarity of the items, but as more new players joined who knew nothing of the game’s early dupe, speculation rose and prices began to skyrocket year over year, reaching today’s prices in the billions. The lasting effect of this dupe was the realization that the economy isn’t a sure thing; putting all your eggs in one basket isn’t a good idea. Finally, we have the latest dupe that was found during the recent EOC live Beta, a testing ground for the Evolution of Combat changes. Luckily, Jagex put more thought into the combat update than the Beta account transfers as the “Import save” function brought with it a tremendously game-breaking bug. Several players quickly found out that if you drop money in the Beta client, log out and import your save from live, you will reset your gold stack and still have time to pick up the one you left on the ground, doubling your money. While providing a devastating advantage to the players who discovered this dupe during the Beta, it didn’t affect your live account as you only imported saves from the live server, not the Beta. While Jagex wasn’t initially quick to fix this dupe, it was eventually patched so that your original imported save is constant from the first time you load into the Beta. There were no rollbacks so anyone who had already made bank, kept it, resulting in an immensely unbalanced Beta economy with hundreds of billions of illegitimate gold being used to buy high-end PVP gear, though some suggest that this assisted the beta testing to some extent. Some wonder what Runescape would look like if these dupes had never existed, if the Purple Partyhat, not the Blue, was the most valuable in the game, or if thousands of players hadn’t been banned in the XP dupe glitch. With a game as long-lasting and diverse as Runescape, some players may not have even been alive during the first dupe which was arguably the most impactful of the three showcased. What this goes to show is that even a seemingly flawless masterpiece of a game can harbour little lines of rogue code here and there, just waiting to be discovered. The next big Runescape dupe could be right around the corner and new player or old, now you know the truth of some of the deepest and darkest secrets Runescape has hidden under the rug.